A skin for the regular career mode of Football Manager 2017. Final Version released on 27 August 2017. 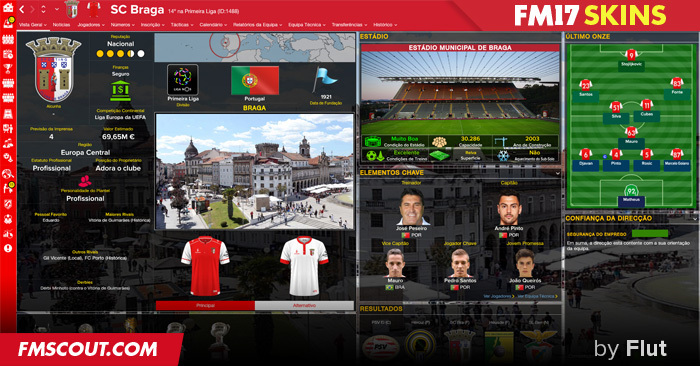 Skin for FM 2017 regular career mode and widescreen (1920x1080). I would like to start by expressing my acknowledgment to all FMfans who keep me motivated to edit the FlutSkin with kind words of support and stimulus. In spite of my great recognition to all FM Skinners and graphic/addons producers that make our FM experience much more exciting, I would like to express a special thank you to PATRES10, for the tailor-made default kits I included in the skin; to NECJEFF, for the original creation of country locator that I adapted in Flutskin; to JOVOVICH, for the wonderful match intro panels; to SIRWILL and PIKAWA, for the match scoreboards I included in the skin; and, “last but not the least”, to RUNE, who has always shared his ideas with me, was responsible for the most innovative idea to improve FM skins visual – the citypics – and who has been a “compagnon de route” since the beginning of this journey. All of you are the main source of inspiration that has made possible to improve FlutSkin since the first time (in FM13) I decided to try to edit a skin. Club overview panel: slightly larger club kits and Last XI tweaked. This skin was made to work properly in 1920x1080 (1080p) full screen mode. As a result, some panels won’t work properly in other resolutions (and also in 1920x1080 windowed mode). In this pack I included a TUTORIAL PDF with instructions regarding the structure of your Graphics folder in order to view the citypics, the kits and the competition logos in player details and in title bar. Start FM17 and go to Preferences screen and then into the Interface tab. You should see FM 2017 Flut Skin dark - Final Version as option in the skin drop down of the Overview box. 374 comments have been posted so far. In the season preview, on the New Managers part of the panel, the top half of the text is cut off. Hi wise: Thanks. Yes I'm working on FlutSkin (for now only in White FlutSkin). Hi man, are you working to skin for fm18? Thanks for your fantastic works. Hi Flut, could you make the skin for 4k please? Because as you said I see some panels bad. 1. Could you please show a screenshot? I don't know exactly what is the panel you refer. 2. Yes. In fat when the club don't have the citypic the standard is shown. You should do the citypic for that club in order to be displayed. For each players you got RAT,AST,CNC,MST,THR and NOT Goals. Can it be change easily ? Guess Throw Ins is not very cool to look at. Would of course like to have Ratings, Goals, Assists for the player scoring and then something else for the others kind of not interrested stats while playing the match. I got another question concerning Citypics. Mostly it's actually teampics in the available packs offered as citypics, but 'm sure you put the correct city number when the Team Screen is shown. Also on "flipping" stadium picture with true citypics. Since no cityID on ex. London (100023) exists anywhere this picture on your team-screen is always "standard". Hi SirAlexAndonov: I dom't know if you did the right procedure. If you want you can send me your settings xml and I will take a look on it. 2. Exit the game and reload it. If doesn't work, clean the cache, exit the game and reload it. Hi phunnelcake: That is weird but if you want you can send me a screenshot of the problem and I can take a look on it. Hello First of all, thank you for your wonderful skin.I would like to ask you, is there any way, to change player attributes colour? for example 16-20 to be orange or something, coz now its a bit lighter green than 11-15 attributes.I tried from the preferences-skin colours, but it doesnt seems to apply the changes. This is the best ever skin! I am using my own facepacks and backgrounds, and this skin is utilizing them the most! It is just fantastic, thanks Flut! Hi michalhb: Thanks. I checked the turkish folder and I noticed that the config is wrong. Thus you can use the folder I put in the following link (this is the folder I use in my game and it works well since the config is okay). First of all Thanks for an amazing skin. Really enjoying the game with this. But I have a problem which appears just in turkish clubs. As you see on the picture below on the "city" box there is a trophy picture but in different clubs from different leaguse I see good city pictures. http://prntscr.com/gjykej Problem appears in both your skins I am using "DS8 Backgrounds Megapack" waiting for help. Hi everyone: I did a "new" intro match. Now the flut default introduction starts automatically. I believe is a good addon. Thus, I decided to share this "new" tweak. Put the files in respective folders. Cheers. Will the SKIN work with the "FC'12" Kits. Hi deka: I don't know if I understood your question. You can see the premier league intro with a click on the epl league button when you are in the match preview lineups panel. Hi, i have installed the skin and it all works great except one thing.. The Premier League intro i have seen on the matches part doesnt work, it just just starts as normal..
Do i have to have it set as "Full Match" or something to get this to work? Hi Bartdude: thank you again for your continuous support!!! I really appreciate it. Yes I will keep on praising you guys with each release of FLUT skin dark because for me it's far and away the best balanced skin ever seen on FM. It combines critical info with a great layout,the best ever IBH panel,the crucial down arrow on the titlebar to easily compare like for like etc etc.You guys really do have a handle on what makes a good skin a great one so please don't ever stop creating for FM because for sure my playing experience would be a lot poorer without it. Handcrafted in Symi, Hellas. Page created in 0.629 seconds.